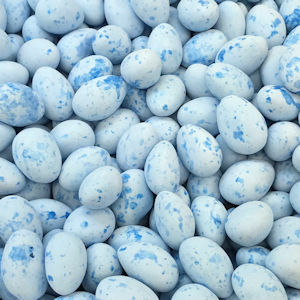 Home / Products / Seasonal / Easter Candies & Pops / x-Caramel Robin Eggs, 1 lb. Sugar, Dark Chocolate [Sugar, Coco Mass (processed with alkali), Cocoa Butter, Butter Oil, Soy Lecithin, Vanilla], Corn Syrup, Cream (Milk), Palm Kernel Oil, Color Added (Spirulina extract, itanium Dioxide), Tapioca Dextrin, Natural Flavor, Salt, Soy Lecithin. This product contains milk, and soy and may contain wheat, peanuts and tree nuts.